A Survey of the Hondt, or Western Scheld, from Antwerp to the Sea; Made, by Order of the Minister of the French Marine, in Thermidor and Fructidor, Year VII, and Vendemiare and Brumaire, in the Year VIII, F.R. [i.e. between July and November 1799] by Beautemps Beaupré, Hydrographical Engineer of the Dépôt de la Marine, assisted by the Citizens Daussy and Portier, Engineers of the same Depot, and by J. Raoul, a Lieutenant of the Navy. London : Published by P. Steel. No. 70 Cornhill, 19th January 1804. 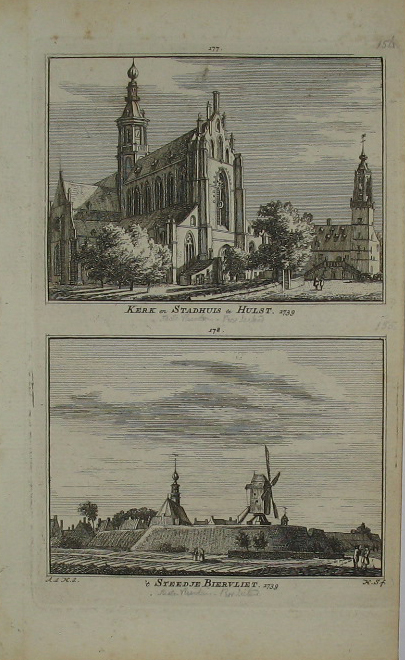 Engraved by S. J. Neele. This impressive map shows the towns along the river banks with reference notes on soundings and tides. In the bottom right corner the city of Antwerp and on the far left the Dutch cities of Middelburg en Vlissingen. In the top right corner an inset birds-eye view of Bergen op Zoom. Printed on three leafs the full length measures 1 meter 85. Verso blank.